First the A’s, then the Angels, now the Yanks deal: M’s must act. Corey Hart has had a disappointing season. The M’s need an upgrade at DH. I’ve already written about the A’s stunning acquisition of Jeff Samardijia and Justin Hammel. The Angels have also bolstered their weakness, their bullpen. July 5th they acquired Joe Thatcher and Tony Campagna from the Diamondbacks, and last week they picked up Huston Street from the Padres. Both the teams in front of the M’s in their division improved themselves in significant ways. Today the news came across MLB Trade Rumors the Yankees acquired Chase Headley from the Padres. With .229/.296/.355 slash, Headley is not exactly the second coming of Mike Schmidt, but he is playing superb defense and will fill a hole for the Yankees in the field. It’s important to be realistic as teams approach the trade deadline. The M’s are 8 1/2 games back of the division leading A’s and 6 1/2 back of the Angels. Both teams are playing very well right now and the Mariners are unlikely to catch them. There is no deal currently nn the marketplace, or likely to be available that will make Seattle so much better they will be transformed into the kind of offensive club necessary to make up that kind of ground. The Rockies aren’t trading Troy Tulowitzki, the Marlins aren’t letting go of Giancarlo Stanton, the Pirates aren’t parting with Andrew McCutcheon, and it would likely take all three to win the division. But the Yankees move is disturbing because the Mariners hold in the second wild card slot, and the Yankees are only 2 1/2 games behind them. Toronto, Cleveland, Kansas City, Chicago, Tampa Bay, and Minnesota are all within 7 1/2 games. It is likely that many of these same clubs will make deals to improve their position in the wild card race. The M’s may lead this race today, but it is hardly a sure thing. The question for the Mariners and Jack Zdurencik is what to do? Act now, trade prospects, improve the team for a one game playoff riding on Felix Hernandez’s right arm, or play the hand you have and hope for the best. It seems unlikely the M’s can win the wild card if they stand pat. They’ve done really well at run prevention, but if we learned anything from the Angels series, it’s that we must score more, even if it’s only a little bit more. Let’s take a look at some numbers. DH Corey Hart .213/.291/.337, OPS+ 80, -5 WAR. Yes, I know David Ortiz is not available. But certainly a bat is available who will have more success in this role than these numbers suggest. DH should provide an offensive boost, not a hitting black hole. Remember when people complained about Jose Vidro at DH? Cadillac by comparison. The Outfield. Dustin Ackley is thriving-at the moment. But we’ve seen these moments before. I like James Jones, but he is till learning at the major league level. Though he has scored 38 runs, third most on the team behind Cano and Seager, he has only 12 extra base hits and no home runs. Endy Chavez is a guy like Doug Strange and Stan Javier who played sparingly and made great Mariners teams better. Michael Saunders is the best of the lot at this point and he is injured. The Mariners outfield has hit a total of 14 home runs, or the same number second year player Mike Zunino has hit. They don’t get on base enough, or have enough speed to make up for the lack of power. The Mariners need an upgrade in the outfield. SS Brad Miller. Miller is hitting .204/.272/.323. I know Miller struggled out of the gate and picked himself up in June, but he’s back in a funk again. Surely there is an upgrade out there somewhere–maybe even within the organization. 1B. Lots of guys have had a shot at this: Justin Smoak, Logan Morrison, Corey Hart, even Willie Bloomquist. Nobody is prospering. Smoak was sent back to Tacoma last night in a roster move. Despite some initial success after his recall from the DL, Morrison has struggled. Bloomquist doesn’t belong at first. First base is an offensive intensive position, and instead production here is just offensive. Starting pitching. The M’s have gotten by managing Felix, Iwakuma, Chris Young, and Roenis Elias, and for the most part they’ve responded unbelievably well. But Elias will run out of innings soon and Young hasn’t thrown this well this long in years. The fifth spot is another gigantic question mark. Hopefully James Paxton will return soon. It’s clear Lloyd McClendon isn’t enamored of 21-year old Taijuan Walker at this moment, and thinks even less of Erasmo Ramirez. The help wanted sign is out. 1B/3B D.J. Peterson is the right handed power bat the M’s hope will power this team in the future. It’s clear the Mariners are fishing in a very shallow pool of talent for mid-year reinforcements, a pool that’s also being fished by many competitors. The question is, who do you let go of in exchange for upgrades. If I were the M’s there are some guys that are untouchable-Zunino, power hitting right hander D.J. Peterson, and James Paxton. Walker could be had for the right deal, though it’s clear we haven’t seen the best of him. . The M’s do have some pieces, mostly prospects, to make a clear upgrade, and let’s face it there are positions that are easily improved. They shouldn’t be afraid to deal, as long as they aren’t mortgaging their future with little return in time and talent. In other words, don’t be trading Walker for a guy who walks at the end of the year. I don’t expect a blockbuster makeover, but there are some of those mid-level guys that are or will become available in the coming days who can strengthen this team. As we head into August and the importance of every win and every loss is magnified, what is or isn’t done at that trade deadline will take on added scrutiny. Yesterday, in a run up to the trading deadline, the M’s made some important roster moves. They called up DH/OF Corey Hart to Seattle, and DFA’ed outfielder Cole Gillespie. 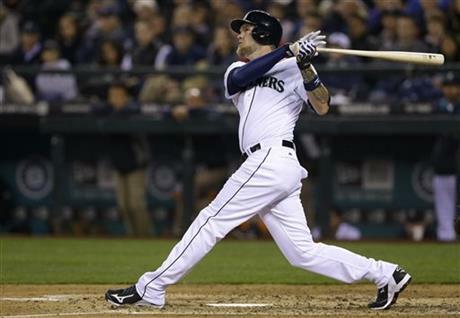 In a second move, the Mariners optioned first baseman Justin Smoak to Tacoma. Hart and Smoak were both rehabbing injuries in Tacoma. The deadline for decisions on their situation was July 7th. Hart, hitting .204/.288/.345 after last night’s game in Chicago was signed as a free agent. His production at the plate, as a power hitting right=hander is disappointing, but it’s important the M’s see what they have before they make moves prior to the trade deadline, if they make any. Smoak’s demotion follows five seasons of waiting for the big switch-hitting South Carolinian to blossom into a consistent hitter. During Smoak’s time on the DL Logan Morrison has filled in well at first base. If the Mariners are looking in-house for answers to their offensive woes first, the A’s took the bull by the horns and made a gutsy trade with the Chicago Cubs. They picked up pitchers Jeff Samardzjia and Jason Hammel to bolster their struggling rotation, sending highly rated prospects, shortstop Addison Russell, pitcher Billy McKinney, pitcher Dan Strailly and a player to be named later to Chicago. Russell was a 2012 first round draft choice, and McKinney was a 2013 first round draft choice. The trade, for two of the more highly regarded pitchers believed to be available this summer, adds depth to the A’s rotation. Samardzjia, (2=7, 2.83 ERA) and Hammel (7-5, 2.98 ERA) were both having solid seasons for Chicago. Though Oakland continues to lead the American League in ERA, they now trail Seattle in runs allowed. The dominant performances by their starters early in the season have come less frequently. In other news, the Mariners were left for road kill after being sliced and diced by White Sox starter Chris Sale, 7-1. Sale gave up six hits, struck out 12, walked nobody and generally baffled Mariners hitters for the complete game victory. Mariners starter Roenis Elias surrendered home runs to Davan Viciedo and Jose Abreu, while pitching five innings and allowing five runs. Charlie Furbush continued the Mariner tradition of coughing up big home runs to Paul Konerko, surrendering a two run blast in the eighth inning. What is the Robinson Cano effect? Robinson Cano is fourth in batting average in the AL, hitting .323. He is tied for sixth in OBP with .383. He is in the top twenty in hits and runs scored. He is unquestionably the Seattle Mariners’ offensive leader, though his power numbers are down from his career statistics across the board. When Cano signed his incredibly rich contract last November there was considerable criticism of the deal. $24 million a year was too much. Ten years was too long. The Mariners would never receive returned value on such a deal In truth, measured by WAR, Cano with his 2.8 WAR ranked 17th by ESPN, is well behind some of his less well-paid colleagues. But the Seattle Mariners are playing winning baseball. Their current record is 47-38. The Mariners haven’t been nine games over .500 since the end of the 2007 season. They are currently holding on to the second AL Wild Card spot and trail the Oakland Athletics for the division lead by only five games. There is talk about this team I haven’t heard for years. They are the subject of local talk radio, that before June was the organ for Seahawks football 24/7. There are surprising stories about the Mariners on ESPN.mlb and SI.com. But the real measure of a change in attitude about a team is about the number of butts in seats. Today, the Mariners are ranked ninth in attendance with an average of nearly 24,000 fans per game. Last year the M’s finished 11th in attendance with an average of 21,747. No it’s not the stuff of 2002 with over 43,700 per game, but it’s better. All I know is these guys are as good a group of guys I’ve ever played with, and Robinson Cano has had a huge influence on everyone in here. Robinson Cano, Logan Morrison, James Jones, John Buck, Willie Bloomquist. These are the new position players on this team. Aside from the former Yankee, the rest are role players, though each have contributed to the team’s success. The rest are guys who have been here-Dustin Ackley, Michael Saunders, Mike Zunino, Kyle Seager, Endy Chavez presided over last year’s flop. Together with Lloyd McClendon, Cano has convinced these guys they can go out every day and win. The statheads don’t like to talk about chemistry because they can’t see it in the box scores; they can’t measure the affect of high fives, handshakes and salutes to the bullpen with BABIP, xFIP, or wRC+. .But Cano has them playing hard each day, winning for each other, and that’s the real Robinson Cano effect, not the hits, the power shortage, or the $240 million. The first two months of the season, the M’s suffered through a scheduling nightmare. Through May 21st they played a ridiculous number of road games, with lots of silly travel back and forth across the country. They also played tons of games against division rivals. By May 29th they’d played 18 games against the Athletics and Angels, both ahead of them in the AL West standings, and at this point, the two best teams in the A.L, well, okay, throw the Tigers in there too. Since May 22nd the schedule has tipped in their favor. There are more home games. The road trips are shorter. The strength of schedule is more advantageous, with games against the Red Sox, Cleveland, the Yankees, the Astros, and the White Sox. Careful, things won’t stay that cozy, with series against the Athletics and Angels sandwiched around the All-Star Break. Even so, July and August look like winnable months and the M’s will need some credits in the bank as they roll into a hellacious September. When the M’s signed Robinson Cano to a $240 million deal I was thrilled. They’d have a legit middle-of-the-order bat who could lead this team. No retread recapturing the past. No prospect who might someday be good. Cano’s signing was the real deal, a sign the fans were waiting for. 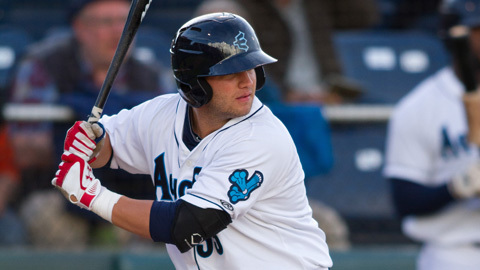 Of course, in their infinite penny-pinching ways, the Mariners management surrounded Cano with retreads (Corey Hart,) and prospects (Justin Smoak, and I use the term prospect loosely,) and said have at it. What has Cano done? Let’s just say the words–he hasn’t hit for a lot of power, only six home runs and 17 doubles to date. Yet, he leads the team with 98 hits, runs scored with 43, and OBP with .378. He is slightly behind Kyle Seager with an .818 OPS. That brings us to the second part of our story and that is Seager. Seager is imperfect. He has massive home/road splits. For example, of his 34 extra base hits, 19 of them are at home, including 11 of his 12 home runs. Yet somehow, when the M’s are at home, Seager finds a way to be the man. When the M’s can’t score at Safeco, he is the one who gets it done. When the Mariners are offensively constipated, more often than not, Kyle is the Ex-Lax. May he continue to loosen their bowels on the current road trip. It has been so long since the Mariners had a catcher worthy of the title, it is a pleasure to watch Mike Zunino behind the plate night in and night out. He does almost all those catcher things well. He blocks balls in the dirt. He calls a great game. He is very good at framing pitches. According to Baseballreference.com, his defense rates in the top five of all major league catchers. That Zunino is also tied with Seager for the team lead in home runs is also nice. At age 23, with little service in the high minor leagues, Zunino missed out on those developmental games that would have made him a better hitter. Hence, he hits only .225, rarely walks, and has whiffed an amazing 86 times in 259 plate appearances. Still there is something incredible to watch as he works with Felix on the mound, finding a way to get those changeups called strikes at the bottom of the strike zone. That he often, in the same game, hits balls with majestic parabolas into the left field seats, the likes of which we haven’t seen since Richie Sexson, makes forgetting his offensive shortcomings easier. Jones is still young and still learning, but today he sits atop the second spot in the line up with a .295 average. He leads the team with 17 steals and always seems a threat to run or score from wherever he is on base. Yesterday’s triple was his fourth in only 212 plate appearances, and he seemed to jog for the the three-bagger. The Mariners haven’t had a player like him since 2001 when Ichiro Suzuki signed with the team. Though not as defensively polished as Ichiro, he should improve as a hitter and an outfielder. His game would definitely improve with a higher walk rate. I think the M’s will need some help to get into the playoffs as a wild card. There is next to no possibility they catch the A’s; they’re just too well constructed. However, I see little reason to trade for pitching. Taijuan Walker took Erasmo Ramirez’s place. While his first start was not a thing of beauty, it did all work out. It’s said Roenis Elias will have his innings capped at 170; he currently has 104.2. It’s likely James Paxton will return before Elias reaches his limit. I know the M’s have been linked to David Price and Jeff Samardzia, but the cost to obtain someone of that quality will likely be considerably more than they can afford to pay. We’ve seen what Paxton can do. It’s likely Walker will be better in the five spot than Maurer or Ramirez. I’d let it ride. But would I trade Walker for a bat? Yes I would, as long as we’re talking a consistent performer with a proven track record, AND will be around for a few years. No Doug Fister or Cliff Lee deals. The Mariners have offensive needs in the outfield, first base and/or DH. I do believe Michael Saunders will give a M’s a bit of a bump, but not enough of one to carry the team. I don’t have faith Dustin Ackley will magically become what he is not. I think it is highly unlikely Corey Hart or Justin Smoak will come back to the M’s and provide a significant offensive boost. There are guys out there: Alex Rios of the Rangers, Seth Smith of the Padres and others that would improve the M’s where further production is needed. There is no way Endy Chavez should be DHing, and Ackley needs another trip to Tacoma to find his missing swing. But don’t overpay. Rios and Smith are both rentals, so deal accordingly. I confess to being a scoreboard watcher, even in June. It’s been a very long time since watching the Mariners standings was very interesting or relevant, so this is a pleasant surprise. That said, there are still plenty of games to play, and teams that are close in the Wild Card standings. Though the M’s are hot, they’ve still managed to lose a half game to the equally incendiary Angels. The M’s are a game and a half ahead of the Orioles, and while other teams, like the Yankees and Royals have faded a bit, the Birds continue to win and remain on their heels. The only solution to that problem is to keep winning. After the final game against the Astros today, the M’s fly to Chicago for a weekend series against the White Sox. They are a bad team, and Seattle has to find a way to overcome their past run of poor performances in the South Side if they want the fun to continue. The Mariners have their destiny in their own hands, and while they can’t win them all, they must avoid lengthy losing streaks. The last couple of weeks witnessed burgeoning offensive performances by the M’s. June 23rd, the Mariners beat the visiting Red Sox 12-3. Since then the M’s have won some tight games and lost some tight games. In the games from June 23rd to the last night’s destruction of Houston, the Mariners hits totals were 14, 10, 8, 11, 1, 10, 11, 18. The two games against the Astros were laughers. The team batting numbers in every category of importance-runs scored, hits, slugging percentage, home runs-continue to rise. The Mariners remain last int he league in the critical on-base percentage, but as batting averages have increased, so has OBP. Team batting is now at .245, up from .232. Even OBP, once stagnant in the .290’s is at .303. The M’s need to take more walks and strikeout less, but as Logan Morrison, Brad Miller, and role players like Endy Chavez continue to improve, the team numbers will get better too. The help wanted sign should still be out there, but this team no longer has the smell of desperation around it. We should remember the M’s are clubbing some pretty terrible pitching staffs right now, but in the past, that knowledge didn’t seem to help much. Always kick a bad team when they’re down, and McClendon and batting coach Howard Johnson seem to have the boys in blue doing just that.